Looking for adjustable basketball hoop BuiltRiteBleachers.com offers competitive pricing on Roofmaster Nitro Get a quote today! The RoofMaster Adjustable Roof Mount Basketball Goal offers infinite adjustability for the customer who has no place for a pole mounted system. 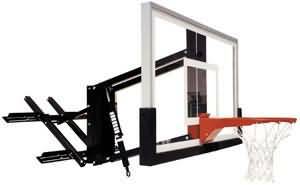 No other system compares to the RoofMaster Adjustable Roof Mount Basketball Hoop from First Team. The unit is versatile enough to mount to any roof pitch or vertical wall surface. The RoofMaster Roof Mount Basketball Goal is infinitely adjustable with the industry's widest range of height adjustment. With a simple turn of the handcrank the RoofMaster Roof Mount Basketball Hoop offers an adjustment range of up to 4-feet (10' - 6'). An easy-to-read rim height indicator displays the exact height of the rim. We offer several backboards and rims with the RoofMaster Adjustable Roof Mount Basketball Goal so you can choose the package that's right for you and your budget. For player safety, First Team offers optional backboard padding for each RoofMaster basketball system. Every RoofMaster Adjustable Roof Mount Basketball Goal package comes with a Lifetime Limited Warranty. Approx. Shipping Weight: 258 lbs.